A porton counting reticle is used to count and measure abrasives and dust particles - most commonly asbestos, paint particles or varnish particles. In order to determine if dust particles in the air are at a safe level, a sample is collected on a filter that will reflect the concentrations of dust at the time and place of sampling. Once the sample is collected, it is placed under a phase contrast microscope and examined using a porton counting reticle. This must be done within two days of sample collection. The half of the Porton reticle with vertical lines serves to define the counting area of the field. Twenty fields located at random on the sample are counted and total fibers longer than 5um are recorded. Any particle having an aspect ratio of three or greater is considered a fiber. The fiber lengths are determined by comparison with the cirles on the reticle. The square that is divided into six rectangles is the counting field area. 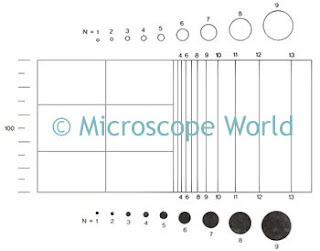 You can learn more about Porton Counting Reticles here.